How have you enjoyed your experience at IE so far? My experience at IE has been really good so far; every day seems to be like a blank page waiting to be written on and filled with new memories, experiences, things learnt, friends made, and so on. I am sure this experience will leave a deep footprint in my life! Is your experience at IE what you were expecting it to be, or have any elements surprised you? Did you find Orientation helpful, interesting and/or fun? Indeed, I found the orientation both helpful and interesting. 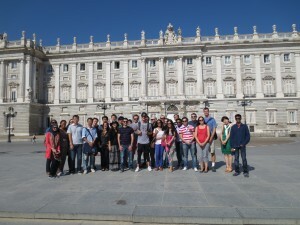 Whether it was while learning about our new best friend: Campus Online, visiting IE buildings, incorporating a sense of the IE code of ethics into us, touring the beautiful city of Madrid, living history by inaction of tales, or while grooming us to be better prepared for what lays ahead; the staff made every effort to make all aspects of the orientation as much fun as possible! What aspects of IE and/or Orientation have stood out the most for you so far and why? The orientation wasn’t only a platform to welcome students; I believe it served as much more. 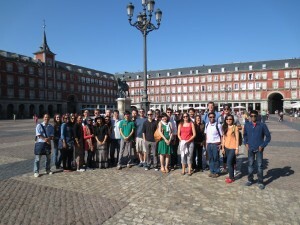 IE attracts students from all over the globe and seeks to have as much diversity as possible. This feature makes IE a breeding ground for knowledge, experiences, and awareness of others’ cultures, traditions, and norms. Considering that IE chose to provide students with an ethics workshop highlights the importance the institution places on its’ code of ethics. To me, this workshop is important as it aims at nurturing a sense of respect and consciousness among fellow students for one another. Furthermore, I was also very content with the Action Learning workshop that very smartly brushed on some of our skills that include (but don’t confine to) communication, decision making, leadership, time management, multitasking, presentation, adaptability, and empathizing. #IEdoingwellbydoinggood (Post 1/2) – Gerardo LaraWhat do you actually learn in an MBA?